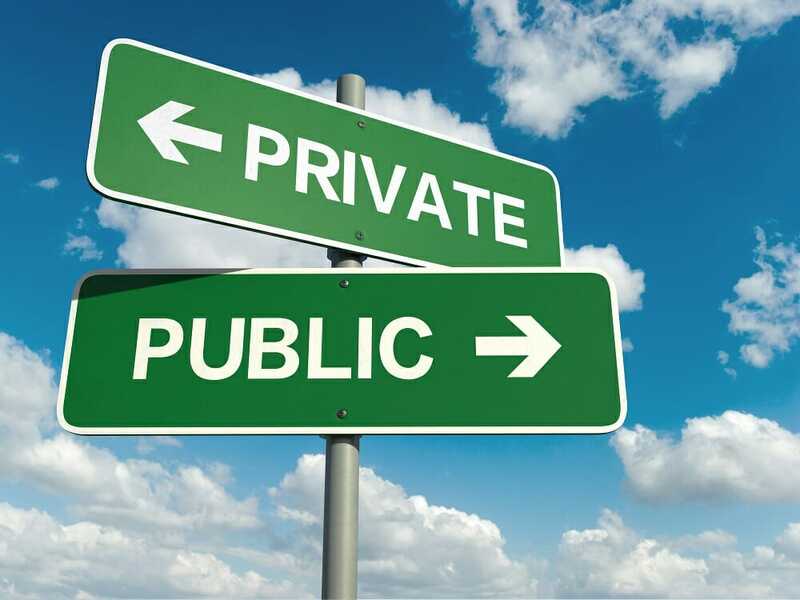 What is a Private vs Public Company? The main difference between a private vs public company is that the shares of a public company are traded on a stock exchangeStock MarketThe stock market refers to public markets that exist for issuing, buying and selling stocks that trade on a stock exchange or over-the-counter. Stocks, also known as equities, represent fractional ownership in a company, while a private company’s shares are not. There are several more important differences to understand, which this article will outline below. The main categories of difference are trading of shares, ownershipStockholders EquityStockholders Equity (also known as Shareholders Equity) is an account on a company's balance sheet that consists of share capital plus retained earnings. It also represents the residual value of assets minus liabilities. By rearranging the original accounting equation, we get Stockholders Equity = Assets – Liabilities (types of investors), reporting requirements, access to capital, valuation considerations, and risks. Being able to access public markets to raise new money, as well as the benefit of liquidity (being able to easily sell shares), is the biggest benefit for public companies. When a business undergoes an Initial Public Offering (IPO)Initial Public Offering (IPO)An Initial Public Offering (IPO) is the first sale of stocks issued by a company to the public. Prior to an IPO, a company is considered a private company, usually with a small number of investors (founders, friends, families, and business investors such as venture capitalists or angel investors). Learn what an IPO is with the aid of investment banking professionalsInvestment Banking Job DescriptionThis Investment Banking Job Description outlines the main skills, education, and work experience required to become an IB analyst or associate at a top, it becomes much easier to raise additional funds. The funds can be used for growth, mergers and acquisitions, or other corporate purposes. Once the company is listed, investors can easily move in and out of the stock by buying and selling shares that trade on the stock exchange. Public disclosure requirements are another main difference between the two types of businesses and a major drawback of being public. As a publicly listed company in the U.S. (i.e., stock trades on a U.S.-based exchange), you are required to file quarterly financial reports (10-Q) and annual reports (10-k10-KForm 10-K is a detailed annual report that is required to be submitted to the U.S. Securities and Exchange Commission (SEC). The filing provides a comprehensive summary of a company’s performance for the year. It is more detailed than the annual report that is sent to shareholders) and several other disclosure documents. Learn more about disclosure requirement for public companies here. Publicly traded businesses are much easier for market analysts and investors to value than their private counterparts. The main reason is due to the value amount of information that’s readily available, thanks to the reporting requirements (discussed above), as well as equity research reports and coverage by equity research analysts. Both types of companies can be valued using the same three methods: comparable company analysisComparable Company AnalysisHow to perform Comparable Company Analysis. This guide shows you step-by-step how to build comparable company analysis ("Comps"), includes a free template and many examples. Comps is a relative valuation methodology that looks at ratios of similar public companies and uses them to derive the value of another business, precedent transactions,Precedent Transaction AnalysisPrecedent transaction analysis is a method of company valuation where past M&A transactions are used to value a comparable business today. Commonly referred to as “precedents”, this method of valuation is used to value an entire business as part of a merger/acquisition commonly prepared by analysts and discounted cash flow (DCF) analysisDiscounted Cash Flow DCF FormulaThe discounted cash flow DCF formula is the sum of the cash flow in each period divided by one plus the discount rate raised to the power of the period #. This article breaks down the DCF formula into simple terms with examples and a video of the calculation. The formula is used to determine the value of a business. Financial modeling via DCF analysis is the preferred method of valuing both types of businesses. However, for a private company, it will be almost impossible without access to internal company information.